One of my favorite weekend activities back home was walking around weekend markets. There was no shortage of options in our neck of the woods and we frequented several. It’s fun to snack on unique homemade treats and see local craftspeople selling their goods. Music is everywhere, from full bands to middle school violinists. It’s a great way to spend a Saturday. With all the gardens in our new neighborhood, the lack of farmers markets strikes me as odd. I’m guessing most of the gardeners must sell their veggies to local restaurants and stores. Some have unmanned stands set up. But no farmers markets. Leave it to the world’s largest city to save the day. 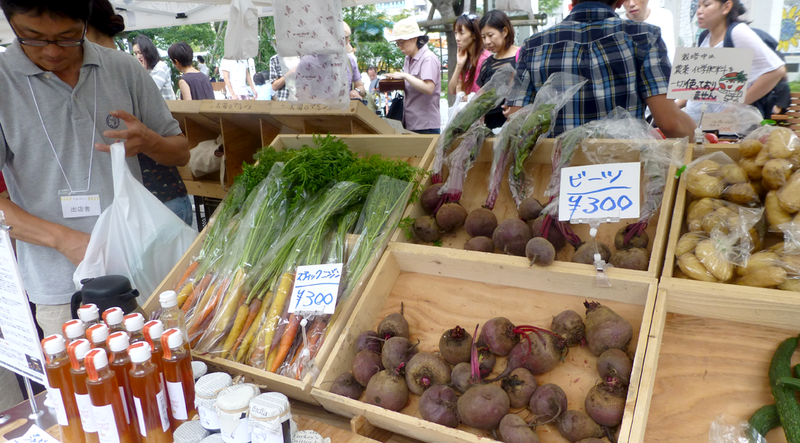 Every weekend, farmers markets spring up throughout Tokyo. 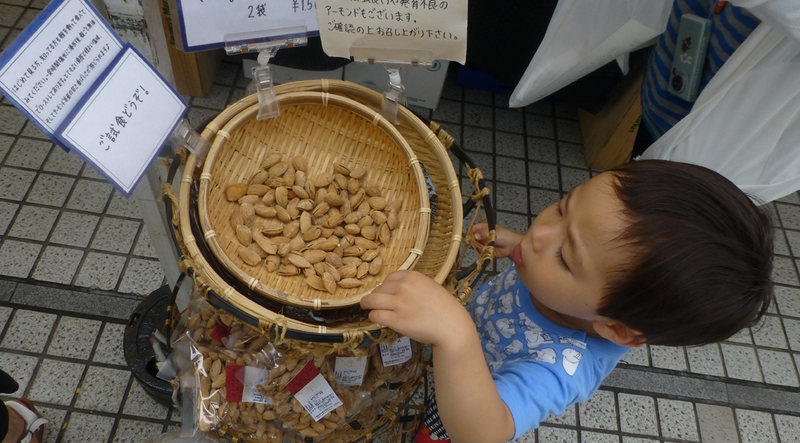 A couple weeks ago, we hit a pair of them: Taiyou no Marche (Market of the Sun) in the Chūō ward and the United Nations University farmers market in the Omotesando district. Taiyou no Marche was the larger market of the two and we stepped off the train around lunchtime. Food trucks lined the path from the train station offering a variety of good eats. We checked out all of our options, but decided on Tofu Burgers from the TofuTofu truck—or more accurately, Volkswagen Bus. The lady taking orders gave me a half-hug when we approached. Food made with love… literally. 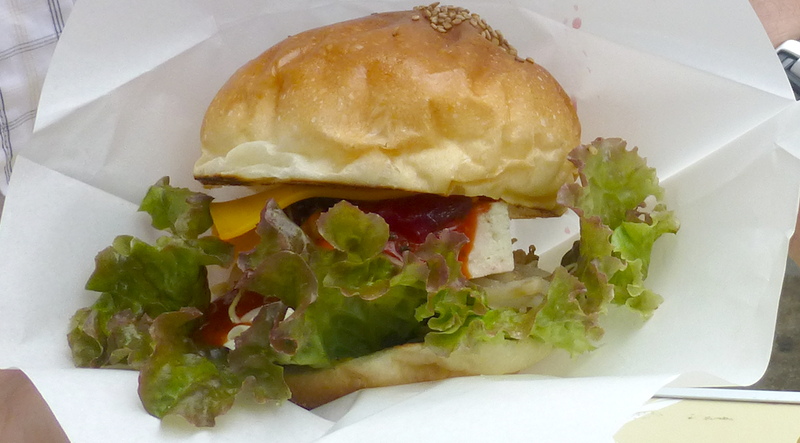 No joke… layered in salsa and cheddar with an awesome fresh bun, I could have eaten this thing all day long. Fueled up, we wandered up and down the aisles of the market. Fresh veggies and Japanese wine (with copious samples) around every corner. One booth was milling freshly-roasted sesame seeds into oil right at the market. The find of the market, however, was beets! I know, right? Beets! Maybe they’ll show up in the stores later in the year, but this was the first beet sighting in Japan so far. The man at the booth spoke decent English and asked how we prepare them. My amazing wife turned into Bubba from Forrest Gump, listing multiple ways to prepare them. The man said his favorite method was to grill them, but we put them into an awesome borsch. 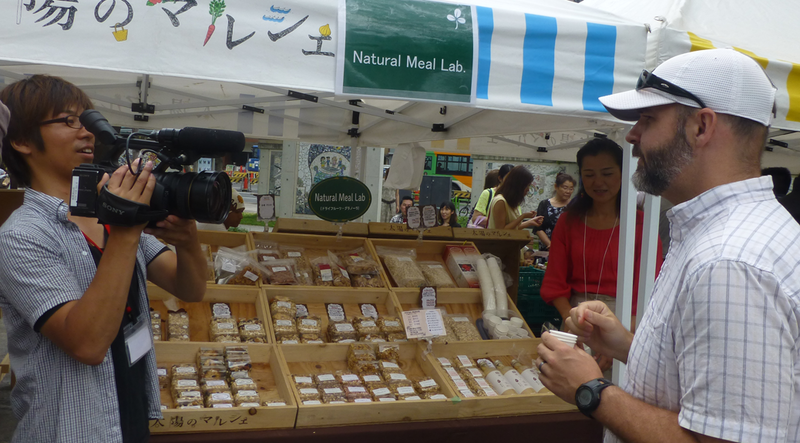 Me being filmed by Japanese TV. Can’t wait to see the treatment if they actually air it because Japanese TV is hilarious! After ensuring our fame on Japanese television, we hopped back on the train and headed for Omotesando. 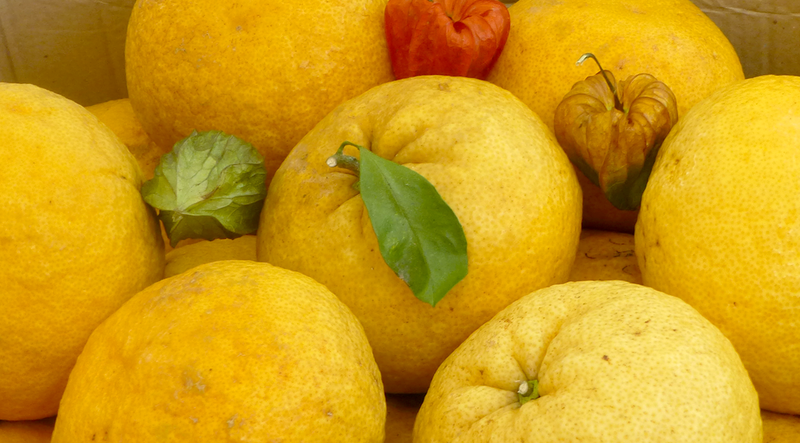 The United Nations University hosts a farmers market every weekend. It was a little smaller than Taiyou no Marche, but had some great food options. One booth sold anadomikan, Japanese oranges that are big like a grapefruit and have a slightly more bitter flavor than a regular orange, but pack the awesomeness of both fruits. The lady kindly explained this as she doled out samples. 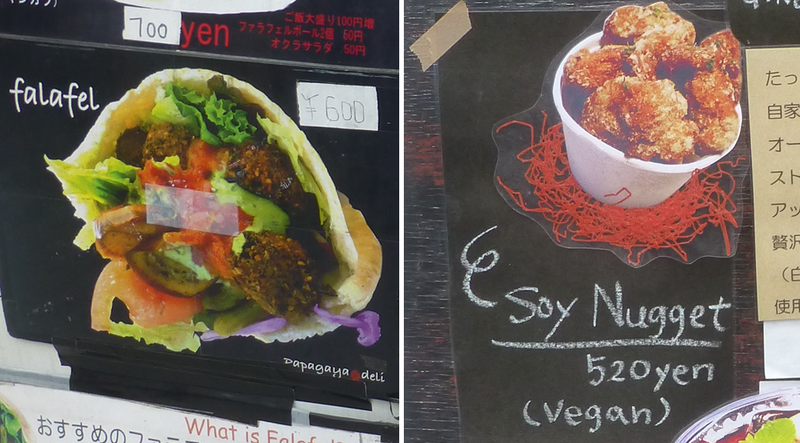 Falafel and deep-fried soy nuggets… my, oh, my! Like the last market, several food trucks circled the booths. We had a couple snacks, including deep-fried soy nuggets (holy smokes, these were naughty!) and a falafel sandwich with chili sauce. Japan is well-known for its kawaii culture, but there was actual cuteness all over this market. Little kids took part in the free samples and the dog-friendly market made it feel like a day in Portland. What appeared to be a dog adoption clinic was being held in the back of the market, which was a nice contrast to the puppies for sale (at $5,000 USD each) in the pet store next to the market. 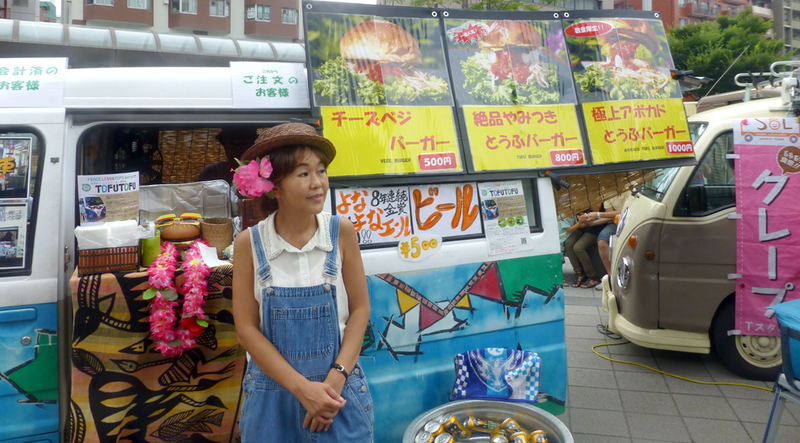 On any given weekend, there’s at least a dozen farmers markets around Tokyo. The access to farm-fresh vegetables filled another gap in our Japan life and I’m sure these market trips will continue throughout the summer.